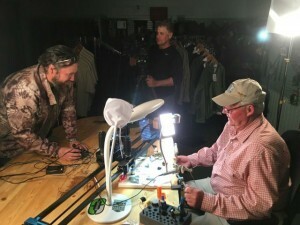 Raven 6 Studios is an independent producer of outdoor television shows for the Outdoor Channel, ESPN and others and they produce a number of well know outdoor hunting and fishing programs. Jason Miller and his crew has been to the Little Red River a couple of times this spring working on a new show about our wonderful river. 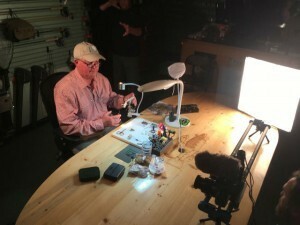 Last Sunday night we did a video shoot at The Ozark Angler fly shop here in Heber Springs, AR., to demonstrate some of the proven fly patterns that are so successful on our river. My good friend, Bill Wilmert, tied his signature fly, The Dena, and I tied a classic sowbug which is probably the all around staple food source for trout on the Little Red River as well as the other trout streams in northern Arkansas. 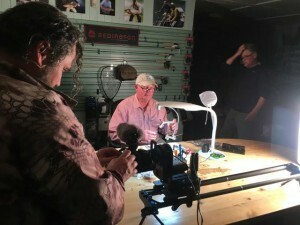 Janson and his group had an amazing array of video equipment and lighting for this project. 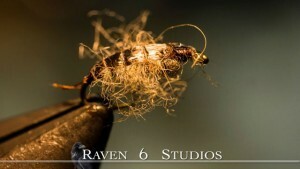 Every single step of the tying of this simple fly required camera repositions, refocusing and lighting changes. It normally takes me about three minutes to tie one of these sowbug patterns but because of the video detail required by Raven 6 Studios it took over an hour and a half to tie just one sowbug! You can easily see the quality of their photography from the sowbug photo above. I have to admit that the photo actually looks better than the fly that I tied! It was a really interesting process and I really enjoyed the experience. By the way, take a close look at the fly tying table in the above photos which was designed and built by another close friend, George Born. The group from Raven 6 Studios will be back here later this spring to film some actual fly fishing that will hopefully focus on some of the great wade fishing opportunities available on the Little Red River. I got a feeling that Caddis may make a cameo appearance. Stay tuned for details.